ANAHEIM, CA - (May 1, 2015) - Anaheim Mayor Tom Tait and Calgary Mayor Naheed Nenshi agreed to a friendly wager as the Anaheim Ducks and Calgary Flames go head-to-head in the second round of the 2015 Stanley Cup Playoffs. If the Ducks win, Mayor Nenshi will wear a Ducks jersey at a Calgary City Council meeting, make donation for every goal scored by the Ducks in the series to ACT Anaheim, and sing “Let It Go” at a City Council meeting. If the Flames win, Mayor Tait will wear a Flames jersey at an Anaheim City Council meeting, make a donation for every goal scored by the Flames in the series to the Calgary Food Bank, and sing, “Alberta Bound” at a City Council meeting. 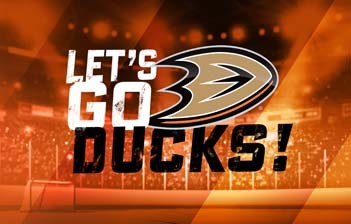 The Ducks and Flames resume Round 2 on Sunday, May 3 at 7 p.m., at Honda Center. This marks the second time the two clubs have faced each other in the Stanley Cup Playoffs.